“Wood-boring beetles” or “powderpost beetles” are actually four separate beetle families with distinct characteristics. Named for the powder-like frass they leave behind. 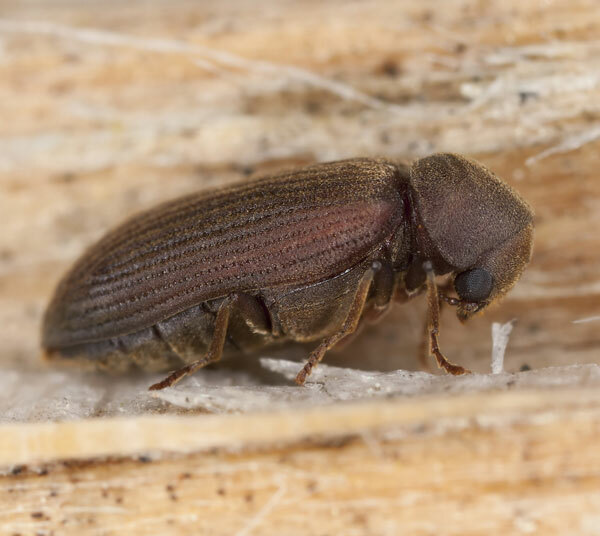 True powderpost beetles infest only hardwoods and are often found in manufactured products in relatively new homes. They can be introduced as eggs or larvae in firewood or wood that has been stored. Flooring, furniture, door and window frames and decorative trim are susceptible to attack. 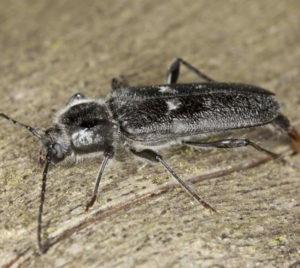 The larvae are responsible for most damage and feed entirely within the wood; however most infestations are not discovered until adult beetles emerge through the wood surface. 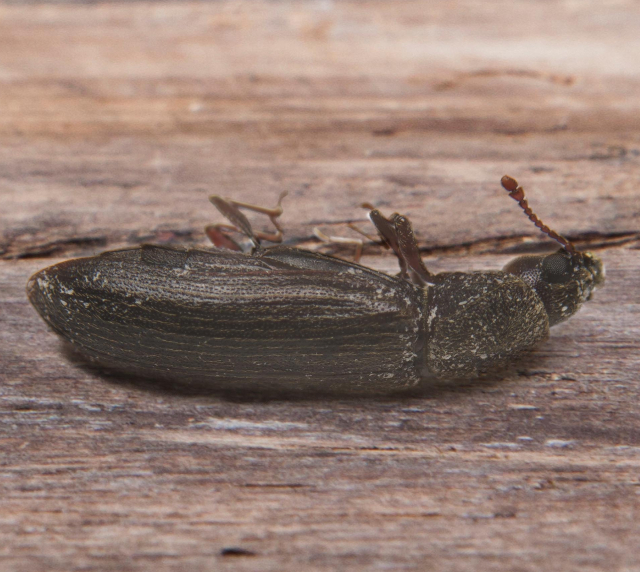 One of the few beetle species that will attack hardwoods and softwoods. Larvae feeding in softwoods produce numerous oval pellets that have a gritty feel. Infestations usually begin in crawl spaces or other areas where wood is near the ground. 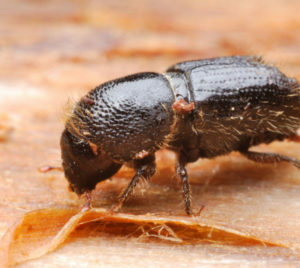 High moisture levels in the wood will speed the development of these beetles and, under favorable conditions, the cycle of re-infestation can occur within one to two years. Damage is usually detected in homes older than 10 years since infestations develop slowly. Adult beetles are more active at night and may become numerous in early to late spring, but are rarely seen during an inspection. If an active infestation is found in a 15- to 20-year-old building, all wood should be carefully inspected for signs of infestation. This is especially important for structures on poorly drained sites or in warm, humid climates. Exit holes indicate that adult beetles have emerged and will continue to re-infest unless controlled. In some areas, the old house borer is second only to termites in damage to structural wood. Old house borers (Hylotrupes bajulus) prefer newly seasoned softwoods, which by chance are typically found in many newer homes. Infestations are often introduced in firewood, but we also commonly see new and reclaimed lumber containing eggs or small larvae. Usually noticeable infestations are limited to a few wood members; however, adjoining sound boards may also be infested by young larvae. Depending on conditions, damage may not be detected until adults emerge three to ten years after the initial infestation. They have been known to re-emerge after 30 years in cold climates. Old house borers prefer dry wood with between ten and twelve percent moisture content in various softwood pine species. As a result, they have become prevalent in residential buildings. Their feeding tunnels are rough cut and the exit holes are oval – typically twice as long as wide. The frass is larger, barrel shaped and usually yellow in color. Due to their size, larvae may be heard feeding, and this chewing noise is an alarm bell for possible infestation. Average 2-10 year life cycle, up to 32 years. Originally a tropical pest, today Bostrichidae are found throughout North America. These beetles range across North America, and are more prevalent in the mid-Atlantic region and Florida. Bostrichidae mainly attack seasoned hardwood, but will also infest softwood with high levels of moisture and starch. Both adults and larvae feed on the infested wood, specifically on the starch in the wood. Bostrichidae have a propensity to infest in extreme large numbers, and when doing so will not re-infest the wood because all of the available nutrient has been consumed. Usually infests seasoned hardwoods, can attack softwoods.